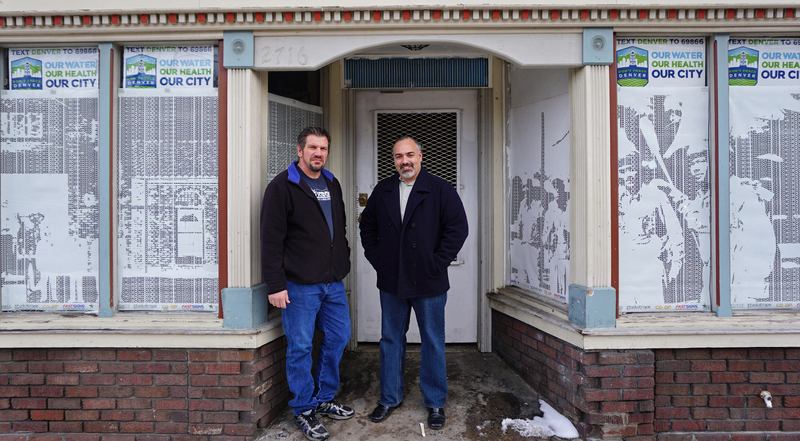 Jay Thomas (left) and Michael Martinez are opening a new bakery in Five Points. Photo by George Demopoulos. A new bakery seeks to sweeten up one of Denver’s historic neighborhoods. The Rolling Pin will open this winter on Welton Street next to Rosenberg’s Bagels. It will specialize in European baked goods like croissants and Danish pastries. “I’ve wanted to do this all my life, and now I have the opportunity to do that.” said Jay Thomas, Rolling Pin’s pastry chef. Michael Martinez, Thomas’ business partner and Rolling Pin’s floor manager, said there aren’t many European pastry shops near downtown Denver. “It’s in need of something like that,” he said. The duo wants to build a new go-to bakery spot in Five Points. It will take around $250,000 to get The Rolling Pin up and running, Thomas said. That price includes renovations to the building, licenses and new furniture, fixtures, equipment and ingredients. The investment will also cover the bakery’s first few months of operating expenses. Martinez and Thomas are still searching for investors for The Rolling Pin and are working with the Small Business Development Center. Josh Pollack, the owner of Rosenberg’s, will be leasing the 1,480-square foot space and subleasing it to The Rolling Pin. The space has sat vacant for 35 years. Rolling Pin’s interior will attempt to capture an “Old Denver” atmosphere with tin ceilings and schoolhouse ceiling lights. The Rolling Pin’s target demographic will be the residents of Five Points. Given Rolling Pin’s proximity to the 27th and Welton light rail station, commuters could also make up a sizable portion of the bakery’s clientele. Thomas has been a pastry chef at Rosenberg’s Bagels since it opened last July. He has also worked in the kitchens of the Grand Hyatt, Denver Country Club and the Brown Palace. Prior to that, he was an instructor at Johnson & Wales University. Martinez currently works as massage therapist, but he studied cake decoration at the Emily Griffith Technical College and has designed wedding cakes as a hobby for years. He plans to decorate specialty cakes at The Rolling Pin. The bakery’s name is a tribute to Thomas’ grandmother, who he remembers making pastries with a one-handled rolling pin. George Demopoulos is a BusinessDen reporter who covers entrepreneurship and fitness/outdoor recreation. He is a graduate of the University of Denver. Email him at [email protected]. 1 Comment on "Bakery fills long-empty Five Points space"
Jay and Michael did our wedding cake. It was both beautiful and awesomely delicious. Can’t wait to visit the bakery!